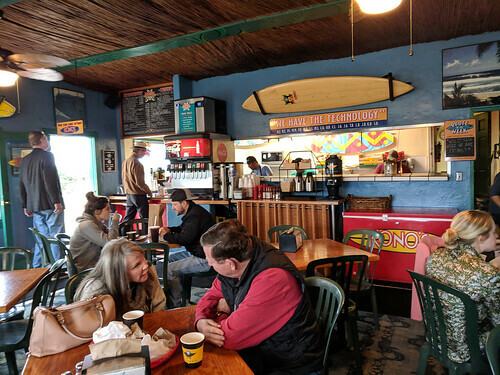 We headed back to Liberty Station for breakfast at the Fig Tree Café. The weather was reasonable, so we sat outside next a heater which was quite comfortable. Place was not too busy when we arrived at 10am but filled up quick. I got the Tuscan Bennie – sundried tomatoes, basil and spinach and upgraded my potatoes to include arugula, parmesan and truffle oil. Eric went simple with scrambled eggs, potatoes, bacon and rye toast. Everything was delicious. No lunch today as we were still quite full from breakfast until early evening so after our happy hour beers at Amplified Ales, we walked to Taco Surf PB for dinner. I got the steak and guac burrito (no extra ingredients, just the good stuff!) and Eric got two hard shell beef tacos to go. Ate dinner while watching the end of the Nishikori tennis match on my computer, thanks to YouTubeTV. Eric woke up early and went for a walk along the beach to watch the early birds (and dogs) enjoy the surf. Then he rustled me out of bed to grab breakfast at Kono’s Café. Cheap and tasty! I got the chorizo breakfast sandwich with a small coffee and Eric had the #3 burrito (eggs, bacon, and potatoes) with a large OJ. It was pretty dreary, so we opted to sit inside. Kono’s was probably our favorite breakfast of the trip, and definitely the best value. With better weather on the horizon, we walked down to The Mission Café for breakfast. I ordered a two shot latte and Eric had the OJ. Drinks took a while to come out – food was much faster! Eric got his usual Mission Rosemary with a huge helping of rosemary potatoes, scrambled eggs and toast. My breakfast quesadillas with bacon, tomato, cheese and green onions were good. I feel like the quality has gone down with our last few visits but it’s still a solid breakfast place in MB. On the way back to our room, we wandered through the alleys on the bay side admiring the landscaping and gathering ideas for a rental on our next trip. During happy hour at Amplified Ales (again) we split the pita bread and hummus which meant we weren’t really hungry for a proper sit-down dinner. Instead we went to Barrel Republic because the PB Ale House next door was slammed. The pretzel bites we ordered were underdone the first time and just slightly less doughy the second time. 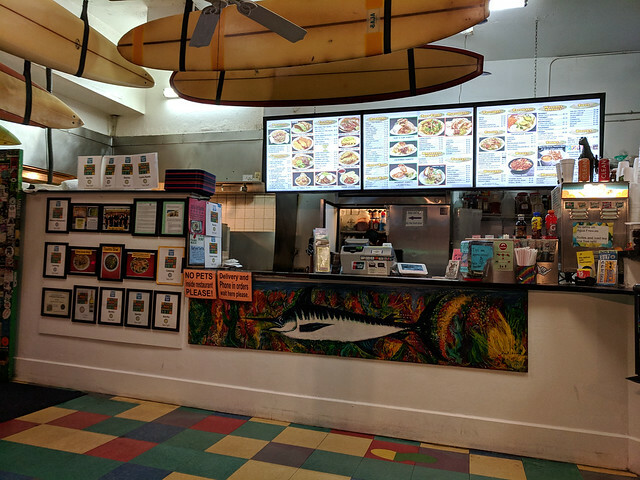 Would not recommend this place for food. Sunshine! Walked over to Crushed for breakfast. 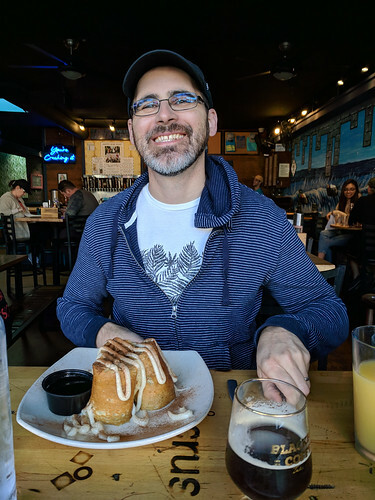 Eric had the Cinnamon Roll (three rolled pancakes with cinnamon filling). The pancakes were a bit on the firm side and the ‘glaze’ was definitely frosting. 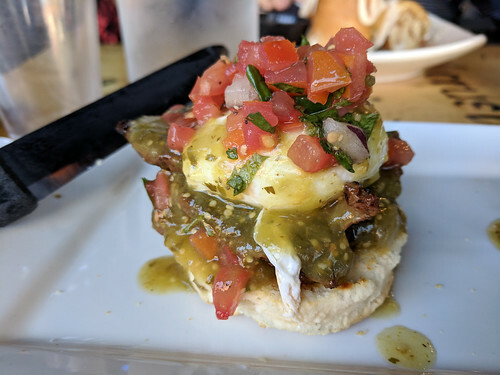 I ordered the El Benedicto Bennie (carne asada and pico de gallo) and a cold brew coffee. My poached eggs were practically raw so the waitress offered to remake the dish but I said one new poached medium egg would be perfect. Came out lovely. I was not impressed with the Bird Rock cold brew – I found it watery – but I am not terribly familiar with cold brew styles so I would have to try another product to give a fair review. In the early afternoon we stopped at Bao Beach for a Bulgogi Bao and Char Siu Bao to go. Both were tasty but enormously messy to eat. Next time I would grab extra napkins and sit someplace I could wash my hands afterwards! After sharing a bottle of bubbles in our room with sunset, we walked to the PB TapRoom for dinner. 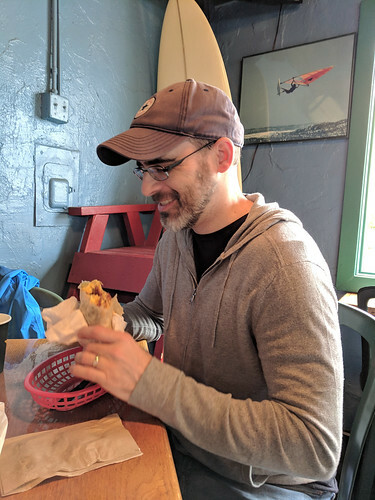 Eric had the Apple Walnut Salad (mixed greens, apples, glazed walnuts, dried cranberries, shaved parmesan, blush-vinaigrette) and I ordered the Grilled Fish Tacos (chipotle aioli, shredded cabbage, pico de gallo, cilantro, sliced avocado) on flour tortillas. We each got what we expected and it was a lovely meal. 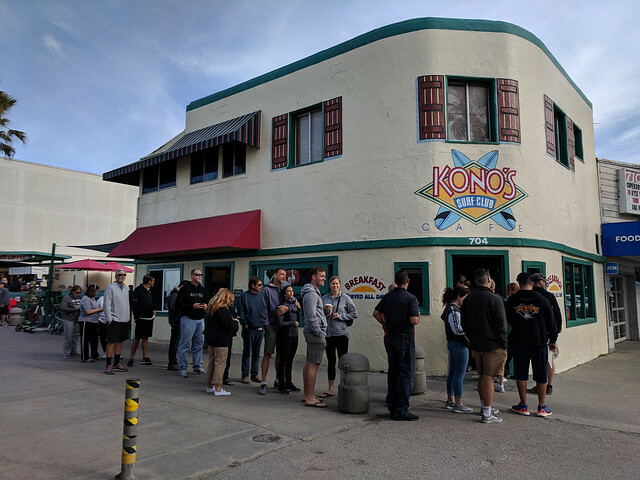 We headed back to Kono’s Café for breakfast and this time we had to stand in line for 30 minutes. Got the exact same order as last time but sat outside on the attached patio and people watched. Great last meal of the trip!